A 'private network' is exactly what the name describes: an internally reachable layer 2 network between as many VPS's as you like. With a private network you can attach multiple of your servers without this impacting the monthly data traffic limit. You order a private network via the control panel by navigating to 'BladeVPS' and selecting the VPS you want to connect. On the right hand side you scroll down to the header 'Network'. There you click the option labeled 'Private Networks'. Select the option '+ New Private Network' and finish the order process. Within a minute the new private network will be visible in your account. When selecting this private network in the control panel, you can then add extra VPS's which are active in your account. The monthy costs are € 1,- ex VAT (€1,21 inc VAT) for the private network (2 VPS's). Every extra VPS you add will come with a surcharge of € 1,- ex VAT (€1,21 inc VAT)a month. There is no limit on the amount of VPS's you can add to private network. Every private network will add another network adapter on your VPS. This will not cause a reboot of your OS, but you will need to configure private IP's before you can make use of the private network. You can find a guide on how to configure private IP's here. You can only use IP's from the specific private IP-ranges: 10.0.0.0/8, 172.16.0.0/12en 192.168.0.0/16. You can also check it's RFC. 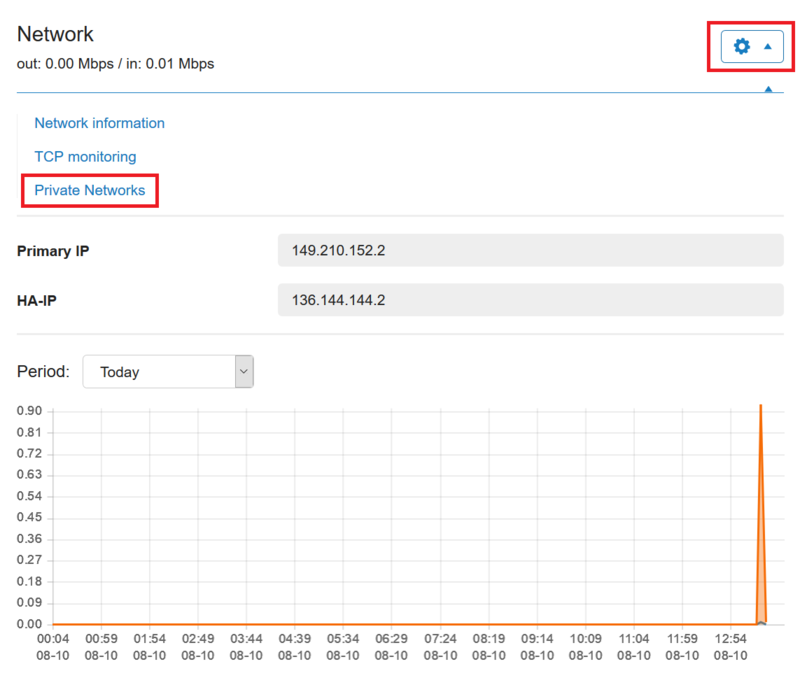 The private network shares the same bandwith on the VPS as the external network connection. You therefore have a guaranteed speed of 100Mbit/s with a maximum of 1Gbit/s. This is however depandant on the bandwith usage of your external connection as well. A private network can not be handovered to another TransIP account, as is possible with a VPS or Big Storage-disk. A private network can not be shared with another TransIP account. You can only connect VPS's from your own account.